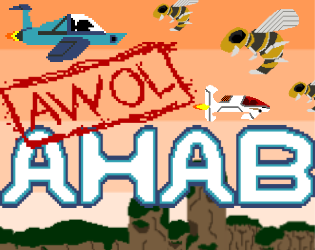 Dolphin pilot Captain Ahab goes AWOL to retrieve a weapon to win an interplanetary war. A shmup where every bullet lowers the score, but hits and destroyed enemies raise the score. Fly the Dolphin through an enemy invasion to find a ship capable of defeating the enemy boss. NOW WITH CO-OP AND CONTROLLER SUPPORT! Like AWOL AHAB on Facebook.